Mile Marker 27: Super Meat Boy! Tired of stodgy corporate games made by The Man and his minions? We're playing the 31 best indie games for a change of pace —- and so we can judge them. Today, Super Meat Boy! An old-school platformer starring cast of indie lead characters, but initially played through with a smiling chunk of meat that can ping-pong between walls. Super Meat Boy! is due out early this year for the Wii and PC. Until then, check out the flash version. The traditional play of a retro platformer gets a fun new look and cast of dark characters in this well put together game. 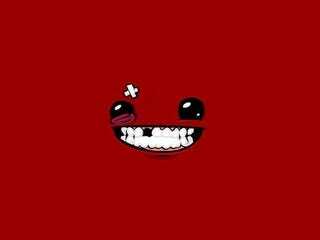 Keyboard controls, for the PC version, have you jumping Super Meat Boy up to splat himself into walls, around buzz saws and over tenderizers. The painfully difficult level design is a good kind of pain, mostly, and the ability to unlock a cast of characters plucked from a slate of popular Indie titles is both a good reason to finish the tgames more than 200 levels and to replay them. Edmund McMillen: To Kill a Mockingbird, Citizen Kane, Beach boys: Pet sounds, Pong. Tommy Refenes: The Help by Kathryn Stockett, Up in the Air, U2: No Line on the Horizon, Modern Warfare 2. Refenes: I actually had no say in the name of the game, but I'm very happy with the name that was chosen. McMillen: Seeing as A name is a label for a noun, normally used to distinguish one from another. I took the name "Meat Boy" to identify a class or category of things, or a single thing, either uniquely, or within a given context, in this context I choose Meat Boy because the character was both a boy as well as made of meat. A personal name identifies a specific unique and identifiable individual person, and may or may not include a middle name, but in this case I choose to forgo a middle name in exchange for an introductory adjective to build on to said name. I choose the adjective "super". a word whose main syntactic role is to modify a noun or pronoun, giving more information about the noun or pronoun's referent. The word Super is given to show that in this case "Meat Boy" is to be looked at as of the highest degree, power, etc.